A severe thunderstorm watch is issued by the National Weather Service when the weather conditions are such that a severe thunderstorm (damaging winds 58 miles per hour or more, or hail three fourths of an inch in diameter or greater) is likely to develop. This is the time to locate a safe place in the home and tell family members to watch the sky and listen to the radio or television for more information. Ask an out-of-state relative or friend to serve as the “family contact”. After a disaster, it’s often easier to call long distance. Make sure everyone knows the name, address, and phone number of the contact person. 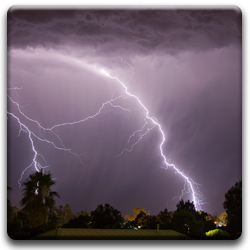 Contact you Local Emergency Management office or American Red Cross for more information on thunderstorms and lightning. If no structure is available, get to an open space an squat low to the ground as quickly as possible. (If in the woods, find an area protected by low clump of trees–never stand underneath a single large tree in the open.) Be aware of the potential for flooding in low-lying areas. Stay from rivers, lakes, or other bodies of water. Because light travels much faster than sound, lightning flashes can be seen long before the resulting thunder is heard. Estimate the number of miles you are from a thunderstorm by counting the number of seconds between a flash of lightning and the next clap of thunder. Divide this number by five. Important: You are in danger from lightning if you can hear thunder. Knowing how far away a storm is does not mean that you’re in danger only when the storm is overhead. Hail is produced by many strong thunderstorms. Hail can be smaller than a pea or as large as a softball and can be very destructive to plants and crops. In a hailstorm, take cover immediately. Pets and livestock are particularly vulnerable to hail, so bring animals into a shelter.